Hunter Steele and his battle spider defend the world of Arachna. Hunter accidentally stumbles into the mysterious world of Arachna. Hunter gets his first lesson in being a Spider Rider from Corona; Hunter insults Shadow, and it looks like their partnership may be over. A new Spider Rider, Igneous, challenges Shadow and Hunter to a battle at the Arachna Coliseum. Hunter gets his first lesson in being a Spider Rider from Corona. Corona takes Hunter to the Hill of Champions. They meet Galena, a woman whose Spider Rider husband disappeared many years ago. Corona takes Hunter to the Hill of Champions. Prince Lumen's attitude and distaste for practice leave Hunter questioning his ability to lead the Spider Riders. Hunter and Shadow fall into the Forest of Bewilderment; from which, legend has it, no one has ever escaped. Corona and Igneous arrange for Hunter to have a day off but can't understand why he wants to spend it sleeping. Hunter et ses amis enquêtent sur des gouffres dans un village lointain. The Spider Riders must stop Buguese before he breaks through the energy shield. The Spider Riders close in on the Spirit Oracles Shrine. 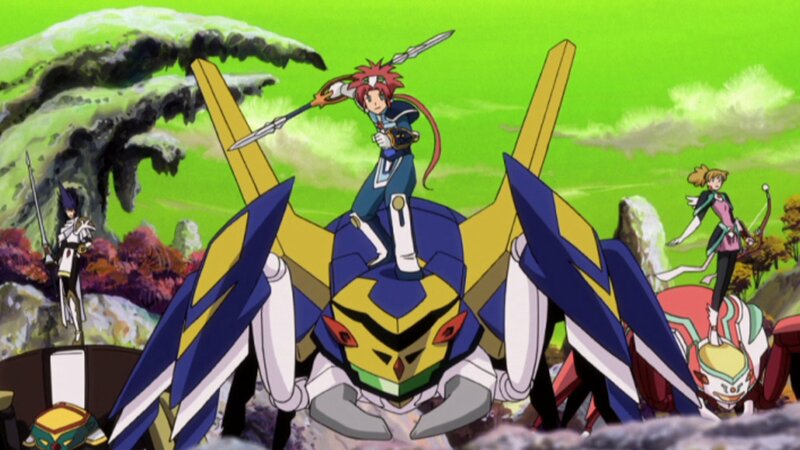 The Spider Riders are not strong enought to defeat Bugese's Battle Beetle. Stag decides to test his strength against Hunter's new power. Corona and Hunter must find a ghost before it causes disaster. When they visit her hometown, family and friends think that Corona and Hunter are a couple. A former friend challenges Igneous to a battle to the death, which Hunter and Shadow must stop. Unmasked Aqune is after the same Oracle Key as Magma and Hunter. The Spider Riders must stop Lumen before he gives the Oracle Key to the Invectids. An Invectid army tries to ruin the Spider Riders' play. Corona begins to long for a normal life. Mantid uses Oracle's stolen power to make himself a godlike being. After failing to retrieve the Oracle Key from the Spider Riders, Grasshop finds himself demoted and plots to regain his prominence. Stags' army lays waste to the Kingdom of Nuuma in search of the Oracle Key. After finding out the Invectids have invaded Nuuma, Hunter is determined to come to the country's rescue. Stags' forces have overrun the city of Nuuma and the Oracle creates a force field around the Castle and levitates it into the sky. When a mysterious, old man claims to be the hero Quake, Magma is beside himself with joy at meeting his childhood hero. The Spider Riders interrogate Grasshop, hoping to find out the Invectids' plans for the Oracle Keys. Queen Illuma commands the Spider Riders to flee. A fierce battle with Stags leaves Hunter buried under a pile of rubble; Shadow's quick thinking protects his partner and the battle resumes. Slate and the Arachna guardsmen fight to defend Arachna against Invectid. The Spider Riders settle in to normal life. Mantid lights the Invectid city for the first time in years; a rousing speech rallies his minions to renew their assaults on Arachna. Beerain has become a fugitive since discovering Mantid's plans to destroy the Inner World. Beerain informs the Spider Riders that the only way to reach Invectid Headquarters is through the dreaded Labryrinth. Hunter is ready to hand the Oracle Keys over to Mantid and end the war, until the sudden appearance of the hero Quake changes everything. The Spider Riders journey to Mantid's Citadel led by Grasshop, desperate to confront Mantid before the Oracle's sun goes dark for good. Mantid createss his glowing Ark of Destiny using Oracle's stolen power, enticing Hunter into another futile attack.